*This part replaces obsolete part #: 145323-03 and 145323-02. This is a genuine manufacturer-supplied replacement which is specially designed for use with DeWALT and Black and Decker saws. 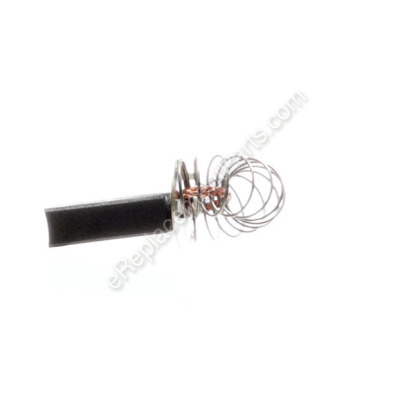 The purpose of a brush is to conduct the current in an electric motor that powers the tool. Unfortunately, the material will wear out and it may cause intermittent performance eventually requiring a replacement. Keep in mind this high-quality brush is sold individually When replacing carbon brushes, be sure to also inspect your armature for burns, cracks, or other damage which indicates a larger motor problem. Not sure if your carbon brush is causing your motor problems? See our power tool repair article: Whodunnit? The brushes or the switch? Hello Paul, Thank you for the question. You will need to order two brushes. Good luck with this repair! Hello Michael, thank you for your inquiry! Yes, part 145323-06 will fit your model DW744. I hope this information helps! Remove brush caps with a screwdriver, then remove the old brushes. Install the new brushes, then replace the brush caps. Replaced the old brushes with the new. Saw had failed to start and the best solution for this problem was to replace the old brushes. I was able to purchase the replacement brushes and springs at ereplacementparts.com and I was pleased with the ease of installation and moreover by the exceptional follow-up and delivery time!! All you have to do is remove the brush caps, remove the old brushes and install the new brushes , then screw the brush caps back on. Kudos to you all and I have already sent you several customers!!! Now the saw is like new and I am back in business thanks to the parts and speed of delivery! Removed the brush caps, removed the old brushes, installed the new brushes, replaced the brush caps. Removed brush caps. Removed old brushes. Installed new brushes. Installed brush caps. Circular saw ran yet but weak, lot of sparks coming from where the 2 brushes met the armature. New brushes much more power n less sparks now. Took the two brush caps off, that someone had tried to, or had taken off before with a screw driver that was to narrow. Got the caps off, replaced the brushes I bought easily n cheaply on e replacement parts.com. put the new caps on. The saw looks n runs much better than it did. My DeWalt 744 table saw could barely rip a piece of pine after years of great service. I suspected brushes but was not sure. 1. Unscrewed carbon brush cap from armature cover. 2. Removed old carbon brushes. 3. Inserted new carbon brushes. 4. Screwed the caps back onto the armature cover. Unscrewed cap, pulled out brush, pushed in brush, screwed on caps.